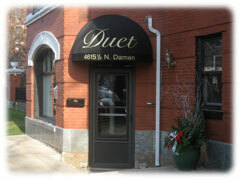 Founded by Wendy Whalen in 2004, Duet is a salon that celebrates the relationship between the stylist and client. It’s about the collaboration and chemistry that happens when a stylist and client share ideas and explore possibilities. The best looks come from skilled professionals who listen, who know how to make the most of a client’s assets, and who take the time to do things the right way. Wendy’s approach has attracted an extremely loyal clientele, many of whom have been with her for more than 20 years.